For games for previous iPod models, see iPod. The iPhone is Apple's first mobile phone. As well as the expected cellphone functions it features a multi-touch screen, various audiovisual capabilities, and an accelerometer that detects the movement of the device in three directions. 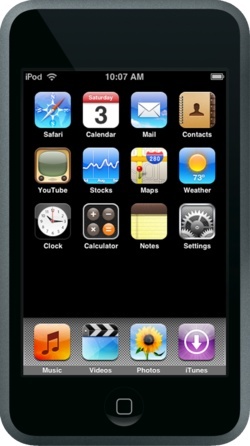 Apple's latest iPod, the iPod touch, uses very similar hardware and runs the same operating system; as a result, it can play the same games. Games for previous iPods do not work on the iPod touch. The iPad is a tablet computer designed and developed by Apple. It is particularly marketed for consumption of media such as books and periodicals, movies, music, and games, and for general web and e-mail access. At around 700 grams, its size and weight are intermediate between most contemporary smartphones and laptop computers. Sales of the iPad tablet are strong: since its release in April 2010, Apple has sold 3 million iPads. The iPad runs the same operating system as the previously introduced iPod Touch and iPhone (initially iPhone OS 3.2, with an update to iOS 4 announced for Fall 2010). Likewise, it is controlled by a multitouch display sensitive to fingertip contact with up to eleven fingers. This is unlike most previous tablet computers which instead used a pressure-triggered stylus. It runs iPad-specific applications as well as those written for the iPhone and iPod Touch, including e-book readers. The iPad uses Wi-Fi or a 3G mobile data connection to browse the Internet, load and stream media, and install software. A USB cable is required to sync the iPad with iTunes on a personal computer, by which the device is managed. This page was last edited on 24 May 2014, at 23:01. This page has been accessed 59,591 times.